OK so at this stage I’m claiming this to be my first successful print, despite the nozzle colliding with the print after 25 minutes and dislodging it from the plate. But until then things were running smoothly – the issues of yesterday are gone, and I feel like I’m now getting somewhere. Now that I am printing, my biggest gripe is with the SoliPrint software. I’ve observed that the nozzle likes to dart back-and-forth during printing each layer, constantly running through areas it’s already printed and ripping them off the print plate. This is particularly evident for the first layer. Grrrr! Someone really needs to fix this in the next update and get that z-axis lifting when jumping to new areas! I’ve read many people are having success using Repetier Host instead of SoliPrint, so will try this next to compare. Fingers crossed my success continues! In terms of print detail, well it’s not perfect, but without having had the chance to tweak anything (since I’ve never had a print work until now) I’m still happy. The print pictured above is part of the Beer Bottle Lock I designed and gave away for free last year, you can click here to compare the resolution to that of the high quality result from the Up! Plus 2 printer. Obviously not as good (the text on top says “HANDS OFF”), but I’m sure there is room to improve things. Having got to this point after much cursing and reading of the SoliForum for help, I thought it would be useful to compile a list of the main things I’ve done to get to this magical first print. 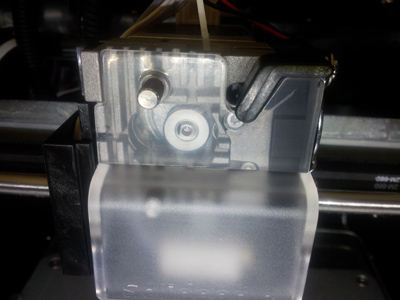 Use an elastic band to secure the cord to the extruder head out of the way – read my previous post for details. When installing SoliPrint, you will need to manually install drivers if you are using Windows 8.1. Download here. Don’t bother printing onto the glass plate without some sort of adhesive – water soluble glue, hair spray, tape, acetone + ABS mixture… it’s up to you. I’m trying perforated PCB’s at the moment, but don’t want to claim them successful or not without much more printing (although so far so good). When you start a print, be at the ready to manually pop the auto-calibration tool up and down – it’s better to be safe than sorry! (Read an earlier post to see videos of what happens when it doesn’t automatically work). 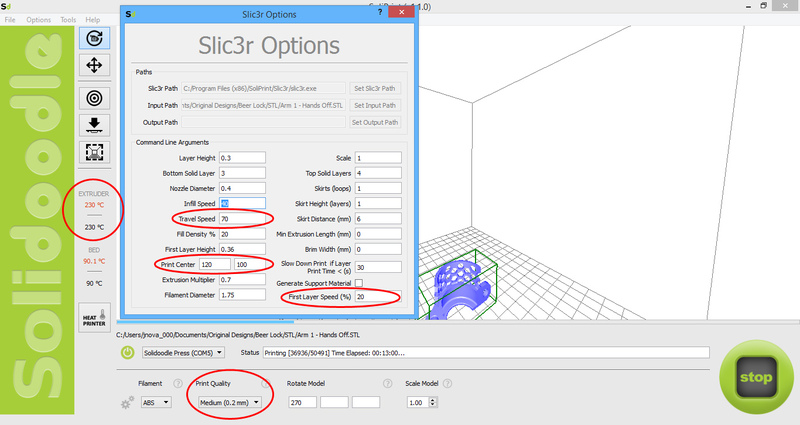 Don’t rely on what you see on screen in SoliPrint – while you might move your model to a certain location, it will still always print in the center of the plate unless you move it within the Slic3r Options menu. (11/02/2015 UPDATE: Thankfully this has been fixed in the latest version of the software 1.1.1) You can also only print 1 STL file at a time (seriously? Come on Solidoodle). 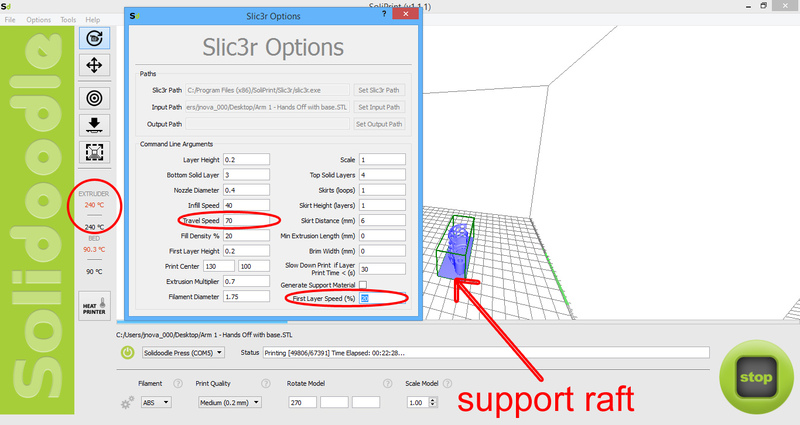 Try the settings below – these are the settings from this first successful print. Perhaps the main one is the nozzle temperature as I feel the default 215 degrees is simply too low for ABS plastic – the Up! Plus 2 uses 260 degrees, possibly allowing the plastic to flow more smoothly. I think somewhere in between (230 degrees) is a good middle ground. Also I have slowed the printing speeds down to give the plastic a good chance to adhere – at full speed things are really moving fast and shaking around. Hopefully these steps will get you on your way to printing if you own, or are thinking of owning, the Solidoodle Press. Also the SoliForum is an excellent resource at the moment. Stay tuned for more prints and possibly a comparison to using Repetier Host to control the Press instead of SoliPrint. Another day, another headache. The video above shows what happens when the auto-level feature of the Solidoodle Press 3D printer fails to pop down at the beginning of a print, causing the nozzle to collide with the print plate. It doesn’t sound good! The only way to stop that terrible noise is to cut the power. Unfortunately this isn’t the first time it’s happened either. The only way I’ve found to deal with this is to turn the printer back on and use the slider for the z-axis height in the settings to drop it down and relieve the pressure on the extruder. 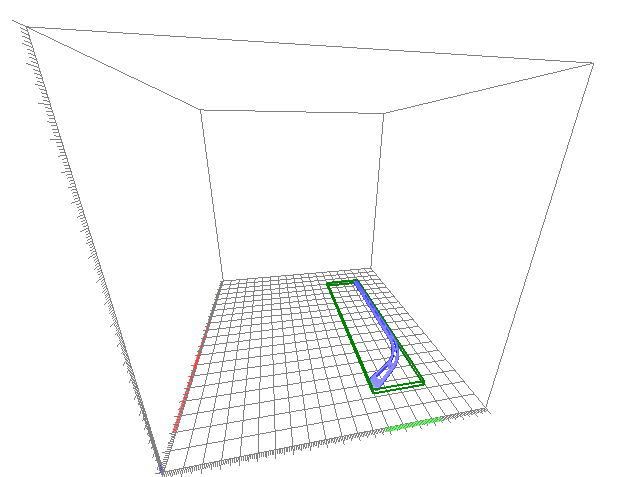 I feel like it’s thrown some of the calibration off though, and with the auto z-axis calibration not working in the current version of SoliPrint, I’m going to have to do some searching online for fixes. If you haven’t read my previous post, a great place to start looking for help with the Solidoodle Press is the SoliForum. Some of you may also be asking what’s going on with my shiny print plate in the video. Well, as mentioned in yesterday’s post I’ve stuck 2 perforated PCB’s onto the glass plate to see if the prints will stick, much like the old faithful Up! Plus 2. So far it seems to only work moderately well (which is still a whole lot better than printing onto the glass), but since my collision problems it doesn’t seem like the nozzle is close enough to the plate anymore during the first layer printing. 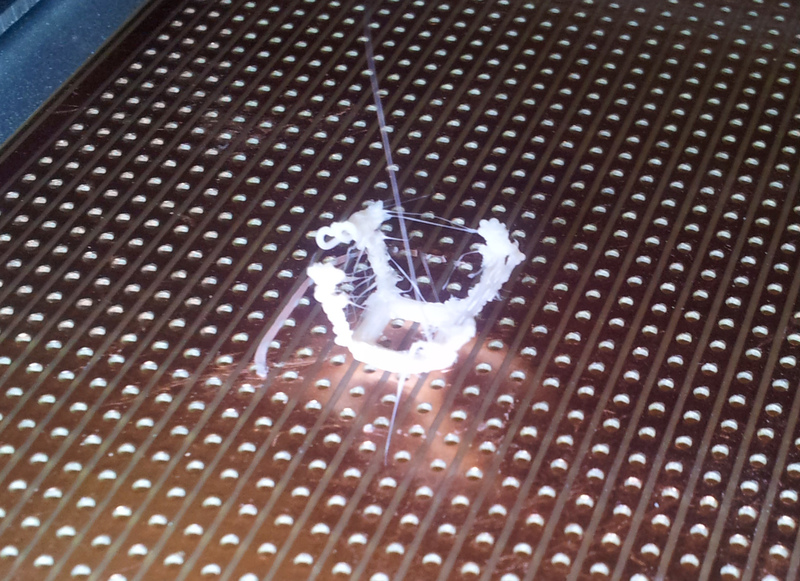 The video below actually shows the start of a successful print with the perforated PCB’s, although there are some major problems with the auto-level tool still not working! In this video I manually dropped the auto-level tool just in time, however didn’t manage to raise it quick enough causing it to collide with the side of the printing plate. What a nasty grinding sound! Amazingly when I flicked the auto-level out of the way the printer actually went on to print something (almost) successful! The photo below shows where I had to stop the print as the small details beginning to snap as they collide with the nozzle, but the main point is that the print stuck to the perforated PCB plate. This gives me some hope! If I can only get the z-axis working properly again I might be able to get that magical first print out! I also have hairspray at the top of my shopping list just to see if that makes much of a difference printing on the glass plate – one way or another I need to figure this all out ASAP! If you’ve experienced issues like this with Solidoodle or any other 3D printer I’d love to hear about it, please comment or subscribe to keep up to date. Believe it or not, my 3D printer has arrived!!! If you’ve read through this blog before or run into me around the place you’ll know that I jumped on the Solidoodle Press band wagon way back in August 2014 when they were first ‘released’ (and I use the word ‘released’ very loosely!). But today is not for complaining, you can read my previous posts about my experience so far with Solidoodle by clicking here. Let me start by saying I haven’t actually printed anything yet, this is literally my first impression un-boxing the thing and connecting it to my laptop. And the first impression is gooooooood! A nice, professional-looking unit not dissimilar to the Up! Mini that was in a design consultancy I worked for. Just a lot bigger (since the build volume is almost double that of the Up! Mini). The printer arrived pre-loaded with a spool of ABS (maybe to soften the blow of so many delays? ), and I like the way the spool is contained within the lid of the unit, further adding to the professional feel. Although I’m yet to see if this limits the use of other brands of filament. The printer also came with a handy little kit of tools and a full-colour getting started guide, all adding to the sense of professionalism and brand quality for Solidoodle. Very nice indeed. Actually getting the printer to connect with the SoliPrint software wasn’t quite as straight forward, since I’m using Windows 8.1 the drivers are for some reason not automatically installed when connected. I had to read a few things on the Solidoodle website and manually install the drivers, but this did solve the problem. I also noticed that the newest version of SoliPrint must have some changes from the earlier one, as the instructions in the printed manual refer to some settings/menus that aren’t there or have a slightly different name. So best to follow this Getting Started Guide from their website, it seems much more up-to-date and thorough. A quick play with the SoliPrint software and it seems easy enough to understand, although as I said I haven’t printed anything yet. Just extruded some material, loaded an STL, heated the print plate and nozzle. The layer settings are 0.3mm,0.2mm and 0.1mm, and there seems plenty of flexibility to rotate models and place them however you like. One thing I do really like is the clear cover over the extruder, allowing you to see the filament feeding down to the nozzle and potentially catch any problems with clogging etc. before they become serious. That’s about all I’ve had time for right now, I’m looking forward to running some prints and side-by-side comparisons with the Up! Plus 2 I have over the coming days and weeks. I know the Press has an auto-calibration feature for the nozzle height, so this will be first up next time.